The 2019 Weber Genesis II gas grill raises the standard in backyard grilling with the GS4 high-performance grilling system, featuring continuous-spark Infinity ignition, revolutionary stainless steel high performance burners, stainless steel Flavorizer bars with flame view window and a Grease Management System. The Special Edition Weber Genesis II SE-335 features three stainless steel high-performance burners that produce 39,000 BTUs of power, a 12,000 BTU side shelf mounted side burner and a 9,000 BTU sear station burner. The Genesis II SE series gas grills come fully equipped with 9mm stainless steel rod cooking grates, stainless steel Flavorizer bars and stainless steel heat deflectors to effectively hold and distribute heat evenly over the 513 square-inches of cooking grates. The Tuck-Away warming rack provides an additional 156 square-inches for a generous 669 square-inches of total cooking area. The Genesis II grills come equipped with a Grease Management System that makes clean-up as easy as possible. The black color finish porcelain-enameled hood has a center-mounted thermometer to monitor cooking temperatures and has painted cast-aluminum end caps. The iGrill 3-ready Genesis II SE grills feature a motion-activated, handle-mounted light for added visibility during night-time grilling and a fuel gauge on propane gas models. The welded tube frame, closed cart design with painted steel doors includes two shelves below the control panel and two side shelves, providing much needed prep space with the left side shelf folding down for compact storage and two heavy-duty locking casters and two large wheels. The propane tank is stored to the side, freeing up the shelf space under the grill and has a tank shield that keeps the tank out of view. Six convenient built-in tool hooks keep your BBQ tools nearby. Cooking Grid Dimensions 25 13/16 X 19"
The 2019 iGrill ready Weber Genesis II Special Edition gas grill is an upgraded version of the iconic Genesis II base model. 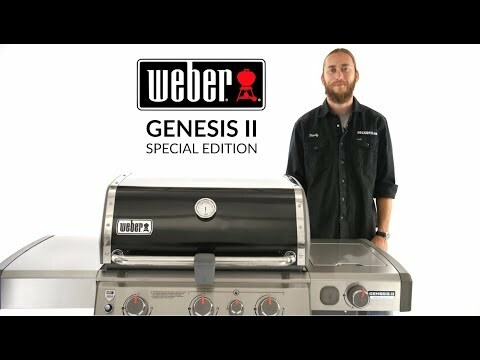 As a proud Weber Alliance Dealer, we can offer you the Genesis II Special Edition, which is not available from most other Weber Grills dealers. Choosing this grill means premium features, including a motion activated handle with lights and thick 9mm stainless steel cooking grates. The Special Edition comes with a 10 year warranty, instead of 5 years like the Genesis II, which come with porcelain enameled cooking grates. The tried and true Weber Cooking System is great at providing even heat distribution and minimizing flare ups. Within the durable cast aluminum housing, are the triangular-shaped stainless steel Flavorizer Bars with a flame view window. They shield the burners by catching drippings and turning them to smoke, adding flavor back into your food. Weber pioneered the Flavorizer Bar in 1984, and since then they've proven to do their job extremely well, which is why they're still preventing flare-ups on all Weber gas grills today! The 2019 Genesis II Special Edition is powered by stainless steel burners that get more narrow towards the back of the grill. This shape reduces heat in the back, producing more consistent heat across the cooking surface. The burners are lit by a reliable push button infinity ignition and produce around 13,000 BTUs per burner on the 3 burner models, and are lit by a reliable electronic infinity ignition. All Weber Genesis ll Gas Grills come pre wired for the iGrill 3. The iGrill 3 Smart Grilling Thermometer (sold separately) is the ultimate grilling tool that makes it easy to achieve grilling perfection. It mounts to your grill allowing you to monitor your food straight from your phone. The Genesis II Special Edition SE-310 and SE-335 come in black, and the SE-330 gives you the choice of four hot colors, including black, crimson, copper, and smoke. The 2019 Genesis II Special Edition grills are packed with features. The SE-330 and SE-335 come with a side burner with a 12,000 BTU burner, and a sear station with a 9,000 BTU burner. 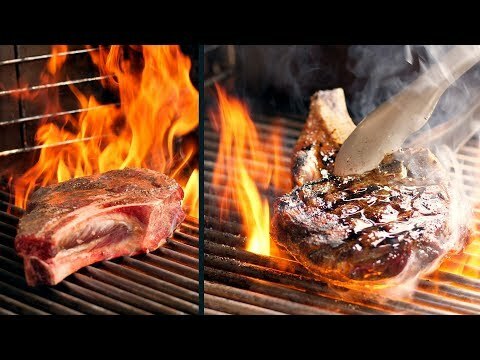 The sear station creates a high heat zone on the grill that's hotter than other areas of the grill, creating restaurant quality sear marks on your food. SE-310 and SE-330 come in an open cart design for easy access to your storage under the grill. Like the Genesis II, the Special Edition saves you valuable storage space with its propane tank storage area, located under the right side shelf. This area conveniently allows you to connect and mount your propane tank underneath the side shelf and features a handy gauge which allows you to monitor your fuel level. As an upgrade the SE-335 comes with an enclosed cabinet with two shelves giving you ample storage, perfect for storing dinnerware and utensils. With over 50 years in business, Weber customer service is as good as it gets. They have a 10 year warranty on the grill body and stainless steel parts parts, like the cooking grids, burners, and flame tamers. They have reputable service and quickly handle any service or replacement part situations. The Weber Genesis II Special Edition does not score well for high heat due to a low maximum BTU output, when compared to other grills in the same class. You want the all-around best Weber Genesis ll gas grill from Weber, the biggest name in BBQ. If I buy the natural gas version, is propane hook up also possible? If so how many parts and how difficult is it so switch between the gas types? Hi, Peg. Weber does not offer conversion kits for their grills. You must use the gas that the grill was designed to use. 25 13/16 X 19" 25 13/16 X 19" 25 13/16 X 19" 25 13/16 X 19"